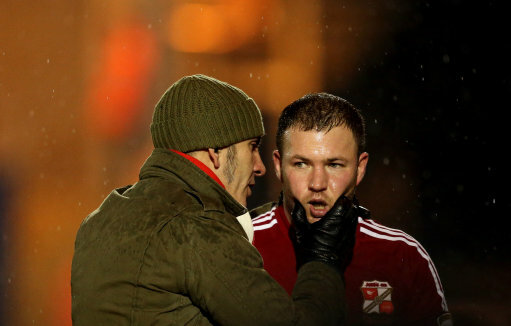 Ex-Boss Paolo Di Canio Sneaks Into Swindon Town’s Offices To Retrieve Some Old Photos… At 1am! During his relatively brief tenure as Swindon Town manager, Paolo Di Canio has found the time to complete a half-marathon by mistake, deck one of his players with an accidental touchline WWF-style spinebuster, openly mock Aston Villa for being a bit crap, actually come to blows with one of his own strikers after a game, brand one of his loan signings as “a load of rubbish”, sing ‘Dancing In The Moonlight’ live on stage at The County Ground, sub a keeper off after 21 minutes and call him “the worst, most ignorant athlete” he’d ever seen, buy pizza for 200 Swindon fans who helped clear the pitch of snow over the winter, offer to buy players out of his own pocket and a whole raft of other assorted nonsense. With all that in mind, it should come as no surprise that, after tendering his resignation on Monday, Di Canio’s departure from The Robins has not been a clean break. According to the Swindon Advertiser, Di Canio snuck into the offices at The County Ground at 1am on Thursday morning to retrieve a few knick-knacks and mementos he’d left at his old desk using a set of old keys which he’d neglected to hand back after leaving his post. The Independent are also reporting that CCTV footage shows Di Canio removing photographs from the walls “in a forceful manner”, with Swindon confirming that they have handed the security tapes to the police and changed their locks to prevent any further unsolicited nighttime visits from a certain Italian basket case. Awesome! Whatever club he goes to next will get a great manager, full of passion and guaranteed to generate the club lots of interest.